This May 2018 animation explains how ranked-choice voting will work in Maine elections. The State of Maine will be the first state in the nation to use RCV in a statewide election, for the June 12, 2018 Primary Election. 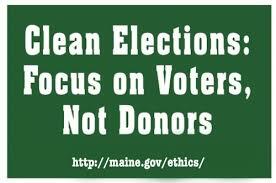 For additional resources and information about ranked-choice voting, visit our RCV Resources webpage at http://www.maine.gov/sos/cec/elec/upc…. I enlisted in the Marine Corps in 1970 and served 2 years active duty. This experience opened my eyes and my mind to how we have to work together as a team to accomplish worthwhile goals. It was the GI Bill that allowed me to earn a bachelor’s degree from Husson College (now Husson University). My health care is provided thanks to the Veteran’s Administration. I’ve maintained a career in finance for most of the 40 plus years of earning a living. I’ve been the finance director at the Waldo County YMCA for the last 14 years and am planning on retiring from that position around the end of 2018. I’ve lived in Bucksport for just over 14 years with my life partner Anna. Initially we moved here to help care for her mother Jane who was having difficulty maintaining her home. We decided to purchase the home after Jane’s death. Since then we’ve been living the American Dream. For most of my adult life thus far, I’ve been an independent voter enrolled in no political party. Bernie changed that for me. In February 2016, I joined the Democratic Party just so I could better support Bernie’s message of hope and a better life for all Americans not just the privileged few. 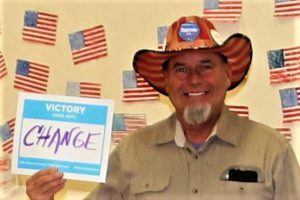 I was elected as a delegate for Bernie to the state convention in 2016. It was a rousing time and the air was electrified. I am running for the legislature now so I and the many people that are supporting me can carry on the message of hope for a better life. Working together we will prove that Maine is a place where we create good paying jobs, protect the environment, provide racial and social justice and have affordable and accessible health care for all Maine people.